For quite a while now, the words and phrases we use when we talk about innovation have bothered me. To some extent that's because the language is too inexact, and in other cases the words have been appropriated or misused. In many companies any new product is labeled "innovation", regardless if it is actually innovative or not. Further, innovation is a word that encompasses so many activities and purposes that it becomes almost meaningless. It is an umbrella term for a lot of different techniques, deliverables and activities, and therefore has little meaning. We can do something about this, however. We can create and demand better definitions and better communication about innovation. To some extent, there have been attempts to create better definitions, or more definitive descriptions of innovation. Take, for example, the concept of defining innovation as incremental or disruptive. These are truly either/or alternatives, but opposite ends of a spectrum of innovation possibilities. On the conservative end of the spectrum you find incremental innovation, which means small changes to an existing product or service, typically within expected confines of a solution or industry. On the other end of the spectrum you'll find radical or disruptive innovation, which means creating something so new and unexpected that it disrupts the existing models or paradigms. Which outcomes are innovation? Well, both are. What's important is understanding the differences in expected outcomes, and the work involved in delivering both. Far too often, it's assumed that innovation MUST be a new product. Doblin in their work identified ten different types of innovation, starting with products but extending to services, customer experiences, business models, value chains, brands and much more. I've included an image that reflects the ten types Doblin has described, in case you are unfamiliar with the model. What Doblin was doing by creating this definition was creating more specific language and texture about innovation. In this regard, using Doblin's ten types, we could have an executive say that the innovation they wanted or needed should be an incremental change to a channel, or a disruptive change to a business model. By defining the types, Doblin has expanded our purpose and language, and hopefully created a better understanding and dialog about innovation, the expectations, investments and necessary outcomes. And this is an exceptionally valuable contribution. But there is at least one more definitional issue that I've frequently stumbled on, and that is the outcome or the intent of an innovation activity. What many executives and managers don't understand is the amount of change that an innovation activity may cause to his or her own business, business model or industry. When these executives ask their teams for innovation, they want the maximum amount of new revenue that can be generated (which means a really interesting and new product, service or business model) but often with the least possible change or disruption to existing business operations (which means incremental change). From our work, we've seen a number of truly innovative ideas that were powerful and valuable simply be rejected because the outcomes were far different than an executive could image. Take for example work we did in the life insurance market. Life insurance is really difficult to innovate, because of the number of competitors and the constraints. Of course, if we can't innovate the product itself we can innovate the channels (online), the experience, the business models and so forth. One idea we had was to use the insights and data collected to add value to other industries - to see aggregated data from decades of experience to other industries that might find value in the data. This idea, which we vetted and found to have value, was so different and so unusual that the insurance firm we worked with stated that they weren't in the data business, even though they manage petabytes of data. The concept of breaking out from offering life insurance and offering valuable data based on years of experience was too confounding. It wasn't an outcome they planned for or expected. Explode: Explode the business model or industry expectations. This type of innovation is rarely done from within an industry by an incumbent, because they have too much at stake in the existing agreements and definitions of an industry or business model. Exploding an existing model (music distribution on physical media vs digital media) typically occurs from outside an industry rather than within an industry. This option includes huge risk, both in terms of the new product or service, which may be rejected by the customer, as well as the risk to the stability of an industry or convention. That's why this alternative is almost never used by an incumbent in an industry, almost always by an entrant. Bridge: create innovations that attack or solve needs or opportunities in a nearby but adjacent market or segment. In this case the ideas are somewhat reasonably anchored in the existing operations but bridge to new opportunities or customers in adjacent spaces. This may cause some change to existing operations and business models, but the change is anticipated and acceptable. This option creates moderate risk both in terms of the new product or service, as well as to the operational capabilities and industry knowledge of the company doing the bridging. Breakout: A breakout innovation is one that intentionally causes a team to leave the industry, constraints or business model of the existing corporation, to explore something new. Our example of an insurance company selling its data to other firms could be an example here. This may require a completely new entity or radically change business models and operations. Large corporate incumbents dream about breaking out of their existing constraints and business models but few do. Apple, in its migration from PC manufacturer to music player to music distributor is a good example of a firm that has attacked different industries and to some extent managed to "breakout" into other models and forms. Most corporate innovation is focused on "doubling down" - either extending existing products or creating new products that still "fit" within the existing operational processes and business models. However, if they "fit", then they are subject to many of the constraints that older, less valuable products and services have created and sustained. Perhaps the most likely alternative for larger corporations is the "bridging" concept, innovating to solve problems or opportunities in an adjacent space, firmly anchored in the current and well-established industry but creating valuable entry to new customers with new and compelling products in a new, tangential space. This bridging respects the operations and existing investment but demands changes to operations, business models and capabilities. Using our four category addition, we can communicate far more clearly and concisely about what innovation should do, what should emerge, and what risks or opportunities we are willing to pursue or leave behind. An executive could now ask for a disruptive channel innovation that bridges to a new industry, or an incremental product that merely doubles down on existing investments and does not cause change. But more importantly they can indicate how much change the product or service must create in the marketplace, and how much change the business, its operations and models are willing and able to bear. Many, many corporations want the breakout or bridging type of innovation, but simply are not prepared to make the structural, cultural and business model changes necessary to achieve either. Then, as they become complacent and leave opportunities on the table, they become subject to the "exploding" option - other new entrants or entrepreneurs explode the existing models or bridge into what seemed like a safe and defendable market or segment. Innovation encompasses all of these "definitions" and many more. When we are inarticulate with our definitions or language, or simply refuse to define what we need and what risks and changes we are willing to bear, we lose opportunities to do more. In the absence of good definition and clear communication, teams will always default to the most conservative understanding of meanings, protecting existing business models, corporate structures, cultures and operational capabilities, which severely limits the potential and range of innovation. Unless and until executives are clear about their goals - not just in terms of profits and revenue but in terms of the amount and type of change they are willing to inflict on their own company and the industry at large - then innovation will be incremental. And that's ok, as long as that was what was intended and what was delivered. I'm about to leave for a well-deserved vacation, but I wanted to leave you, gentle readers, with a parting shot to contemplate before I go. The idea I'd like you to contemplate until my return is that we are all making innovation far too complicated, and we need to stop dressing up the activity with lots of talking points and stop working ourselves and our management into a tizzy about commitments and investments. Of course all of these are important. But what we should be asking, in much the same way the "lean startup" folks are asking about bare essentials and "minimum viable products", is: what is the minimum investment it takes to make my (team, product group, line of business, company) more innovative? I'm going to argue that it's simply three "T"s: time, talent and temperament. Let's address all three of these quickly, so you can go have a good think while I am resting comfortably in an exotic location. Time is probably the most problematic of the three Ts. As efficiency has become a watchword, many organizations have people who are filling two jobs, in meetings constantly and trying to juggle far more day to day operational tasks than they can measure. These individuals aren't doing a good job getting their day to day responsibilities done. How then can we imagine that we can layer on another "important" task - an innovation project or activity - when these folks can barely keep their heads above water on the tasks they are reasonably good at? When you are overwhelmed trying to keep the day to day stuff (where your expertise lies), how can you possibly carve out time for an activity where you have little experience and few defined processes? This is simply a management decision. Innovation requires time. Time to identify interesting problems and scope them. Time to consider emerging trends and technologies. Time to understand unmet customer needs. Time to do an effective job generating ideas and solutions. Time for prototyping and validating concepts. And of course time for the product development process. Your management team needs to understand how much time it will take to innovate, and either free up your time by delegating responsibilities to others, or finding capable people who can do the work without putting day to day operations at risk. You simply will not succeed if you can't find the time to innovate, and will fail if you try to balance too many simultaneous tasks. Innovation will always draw the short straw. Talent in this context is composed of two factors: attracting the people who want to be a part of an innovation exercise, who have passion for creating new things, and giving them the tools or methods that they need in order to do their work well. Most organizations strike out on both counts. When staffing an innovation team, find the passionate people who believe change is possible, who are willing to take risks and explore new options. People who are unwilling to change or explore will simply recreate products and services that already exist. Far too often, the wrong people are in the job. Further, too many organizations neglect to provide or introduce meaningful tools, methods and templates. Even passionate people need to have guidance, and can work more effectively if they have a roadmap and a defined end goal. 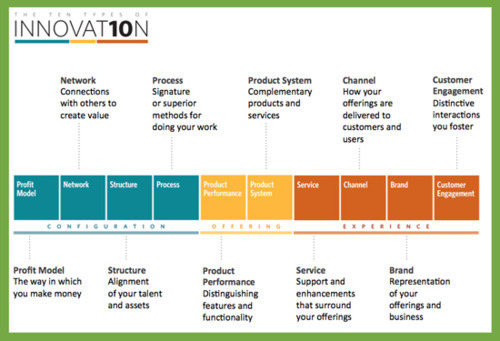 Invest in defining what a successful innovation roadmap looks like, and here's a hint. It does not start and end with idea generation. Temperament is a broad term meant to address three constituents in an innovation activity: the executives who asked for it, the people who are doing it and the culture that is observing it. Executives want perfect answers now, fully documented and easily executed. They won't get that from innovation, unless the innovation is so simple that it reflects existing products and services. Innovation is going to be messy, uncertain and rife with opportunities and possibilities but no certainties. The sooner we set that expectation, and the more the executive team accepts that expectation, the better your activities and outcomes will be. We also need to consider the temperament of the culture of the organization that's observing the innovation activity. Often an innovation activity is watched first with curiosity, then hope, then fear. The fear is that the innovation activity will take dollars or funding from someone else's projects. This is when the antibodies start circling, seeking to limit or kill innovation before it infects the organization and creates too much change. You've got to focus on the temperament of the organization or innovation will wither and die like a lab experiment in a petri dish. Finally, consider the temperament of the team. If you've selected passionate, engaged people, all you really need to worry about is exasperation and cynicism. If the culture or executive team won't support innovation, doesn't provide resources or won't make critical decisions in the lack of full information, exasperation and cynicism increase. Don't let that happen, because once you lose your passionate people, you've really lost a lot of the potential to innovate. A lot of people don't really "get" innovation. They think of it as an event or a project, when it is really an attitude or a mindset. It's not something you can switch on or switch off, depending on need. It's something that people and corporations need to do consistently and constantly, need to believe in and engage in. It takes time, talent and temperament to do this, and you'll notice all three aren't discrete factors that can be easily turned on or off, but are continuous capabilities that need to be engaged all the time. Have a think on this and we'll reconvene shortly. We at OVO get to participate in a lot of idea generation sessions. It's interesting to lead these sessions and to sit in as a guest idea generator. Because most of us have few filters, we are willing and able to generate any idea. Ask me sometime about the credit card that zaps you with an electric shock if you use it too frequently. So when we have all of these crazy ideas, people often ask us: well, how do you do it? How do you constantly generate such crazy ideas? Why are you so much better than us when it comes to generating ideas? The reason is that we are true believers. We believe that there is ALWAYS a better way to do something. All it takes is a little insight, a little imagination and a willingness to free yourself from your day to day constraints. Working inside an organization, especially for a long period of time, an individual becomes part of the fabric and culture of that organization and begins to think like others in the organization, accepting core principles and cultural norms. Over time what seemed changeable seems permanent and what seemed possible seems immutable. It's exceptionally difficult to work inside an organization for very long and not adopt the cultural biases, and typically those biases have to do with maintaining status quo, not creating new products and services. On any typical innovation project we see three categories of participants. The first were asked to be on the team because they've been successful within the execution engine. They know how to make the day to day operations work effectively. They typically try to force an innovation activity to look and feel like a normal day to day process, limiting the scope and rushing to a decision. The second category of people who participate are subject matter experts, asked to participate because they either have deep knowledge or can add a fresh perspective. Most don't have a stake in the outcome unless it materially impacts their area of expertise, which is dangerous, because expertise and knowledge of existing models and methods overcomes their ability to consider meaningful change. The third category is usually composed of people who are "available" - that is, they are busy but have some time that can be spared for the innovation project. What's often missing from this list are what I'll call true believers, people who are convinced that innovation is vital and important. Every company has a number of true believers, but they are often considered problematic because they are constantly asking why things are done the way they are. These true believers are always seeking to do things differently or suggesting improvements or changes to existing processes or products. They are often the last folks to be asked to participate in an innovation project because they are thought to be uncontrollable - they rock the boat a lot. Why do true believers matter? True believers are unique and important to innovation for a number of reasons. First, many of them are dissatisfied with the status quo. They know that it's possible to create better products and services. They WANT to see change, rather than seek to avoid it. True believers of any stripe, in any discipline, don't allow a little resistance or public sentiment to bother them. They are willing to seek out new information and insight even if it conflicts with existing beliefs. They don't allow barriers or roadblocks to discourage them. In fact they often redouble their efforts when they encounter difficult barriers, where many more complacent people will willingly give up. True believers always believe there is a better answer, a better way. They are never satisfied with incremental change, although they'll accept it on the road to disruptive or radical innovation. They like Jobs want to put a dent in the universe. These true believers are found in every business, in every country, in every walk of life. They are difficult to deal with day to day, but impossible to live without if you want to innovate beyond incremental changes. These true believers can be a bit insufferable, and that's why they are found so much more frequently in startups or as entrepreneurs. They believe in their ideas, their insights and aren't going to let a complacent culture, corporate inertia or simple fear of risk and uncertainty become a barrier to their ideas. And they are exactly what most corporations need right now. We are living in an age of great technological and market upheaval, where the pace of change is almost unprecedented and the level of competition unmatched from almost any time since global markets unfolded over 300 years ago. Money flows to where it can find its best return, anywhere in the world and at the blink of an eye. Consumer demand and market conditions shift rapidly. New competitors emerge in places that were unthinkable as competitive hotspots only a few years ago. The people who can lead you out of your corporate inertia are the people you've most likely relegated to the sidelines. The people you know could be valuable but you haven't figured out how to harness them yet. You need to engage the true believers in your organization - the people who want to create real, interesting change - and you need to do it soon. With the changes that are underway, playing a passive defense is not a strategy, it's a recipe for oblivion. Can you find your true believers and task them to create really interesting and valuable new ideas? Can you clear the barriers and remove the inertia and let them create valuable new products and services? Do you even know who the true believers are in your corporation, or have you tamped them down, and squeezed them out in the ever increasing goal of corporate efficiency and compliance? First, find the people who are always creating interesting ideas, people who want to create change. It may be hard to distinguish them from chronic complainers, but with a little work you can sort them out. Instead of leaving them out of innovation projects, learn to work with and manage them successfully. Give them far more latitude to generate ideas, but in parallel give them clear targets to aim for. Second, discover who in your organization has compelling innovation traits. We can help you identify people in your organization who have the traits and characteristics that other innovators share. Contact us about our InnoTraits Assessment to help find the people in your organization who have the skills to innovate, if not the passion. It's strange how music, songs and lyrics stick with you and take on important meanings. In one of my presentations for my book Relentless Innovation I have a slide that speaks to the factors that shape our current business environment. The slide simply reads "What's going on" and every time I present it at a client site or for a speaking engagement I think Marvin Gaye should be singing in the background. Music and its lyrics have an interesting power, one we should learn to engage more. Recently, in an idea generation session with a client, I found myself humming another song. This time it was "Don't rock the boat" by The Hues Corporation. Occasionally I turn to this song and its lyrics when I get frustrated by by clients who don't want to push the boundaries and discover disruptive innovation. What is "Don't rock the boat" innovation? Many innovation projects start out with such promise. We're going to create new ideas! Those ideas will lead to new profits or revenue! We'll swamp the competition and gain market share! Our CEO will get to go on stage in a turtleneck like Steve Jobs and everyone will listen! And other really motivating stuff like that often surrounds the beginning of an innovation activity. The question becomes: what is the real anticipated outcome of an innovation activity? Is it to create incremental solutions - extending what already exists, or to create powerful disruptive new products and services, which would lead to all the hubbub. Far too often, like children at the dessert bar, the eyes are bigger than the stomach. Creating too much disruption may require too much change or investment, or put an organization at risk if the ideas fail. While many CEOs would love a really interesting new idea that drives differentiation and new profits, the executives often don't understand what it takes to create valuable new ideas that lead to differentiated products. This means that the definition of innovation is left to the middle managers, who are efficiency experts, meaning they are really good at creating small improvements to existing products and services. And, since they don't have a specific directive to go put a dent in the universe, a la Jobs, they revert to what they know best, what I call "don't rock the boat" innovation. Don't rock the boat innovation follows all the best practices, engages people in research, conducts meaningful idea generation, and results in incremental products that are nice but not really all that differentiated or new. That's because the managers and executives involved are really comfortable with the status quo, even though they know it needs to change. But they don't have the permission, or directive, or funds, or resources, or time, to do something really different and new. So, they can conduct innovation according to plan, but never put the existing processes or existing commitments at risk. They are innovating, but they aren't going to "rock the boat". What's the problem with "don't rock the boat"? Is there really a problem with "don't rock the boat" innovation? I'll stipulate that there are several problems. First, don't rock the boat will NEVER lead to real benefits. At best the ideas that a project with a "don't rock the boat" mentality will result in incremental new products at best. Secondly, many innovation projects are begun with a lot of fanfare and promise, but are often cramped, dreary affairs that are limited in resources, scope and investments. This dissonance creates cynicism, which is perhaps the kryptonite of innovation. Further, a few projects or activities conducted within a "don't rock the boat" philosophy creates an inertia and an established way of doing things that make it difficult to ever break out of. Think about this another way. What happens to the individual who "rocks the boat"? They are told to sit down, sit still, stop goofing around. They are ridiculed into submission and will never rock the boat again, or may not even be allowed on the boat anymore. Instead, most corporations definitely need to "rock the boat" and perhaps even tip the boat over, to continue the lyrics. Trying to innovate in a very limited and "safe" fashion sustains the status quo. Only questioning the business model, offerings, pricing models, channels and other critical factors will create real difference. To do this, innovation teams need a directive that must come from the top, and that must be constantly reinforced. They need the right people on the team, the right investments and resources in order to do what is necessary, and the right amount of time and risk tolerance. Without these factors in evidence, all innovation becomes a "don't rock the boat" exercise.